Written by Ian Young, Shield Outfitters owner/guide. The Whiteshell is home to some of the best black crappie fishing in Manitoba. Crappie are good eating and fun to catch, but as an introduced species to our area not many people know much about them. Here are some tips to make your next outing a successful one. First off, know your lake. Does it have crappie in it? Do a little research. Locals will usually give you a little information and guide you in the right direction, even if they don’t tell you their honey holes. Where to start? I like to fish the deepest hole in the lake during the winter, particularly during first ice. The deeper holes contain the warmest water and highest oxygen concentrations at certain times of the year. Both of these factors lead to more active fish. Because crappie are a schooling fish, they can be concentrated in small area of a large lake basin, making them very tough to locate. Try and find a point of land that reaches out into a deep hole. A sunken tree or other midlake structure can also provide something for fish to relate to and is a good place to start. 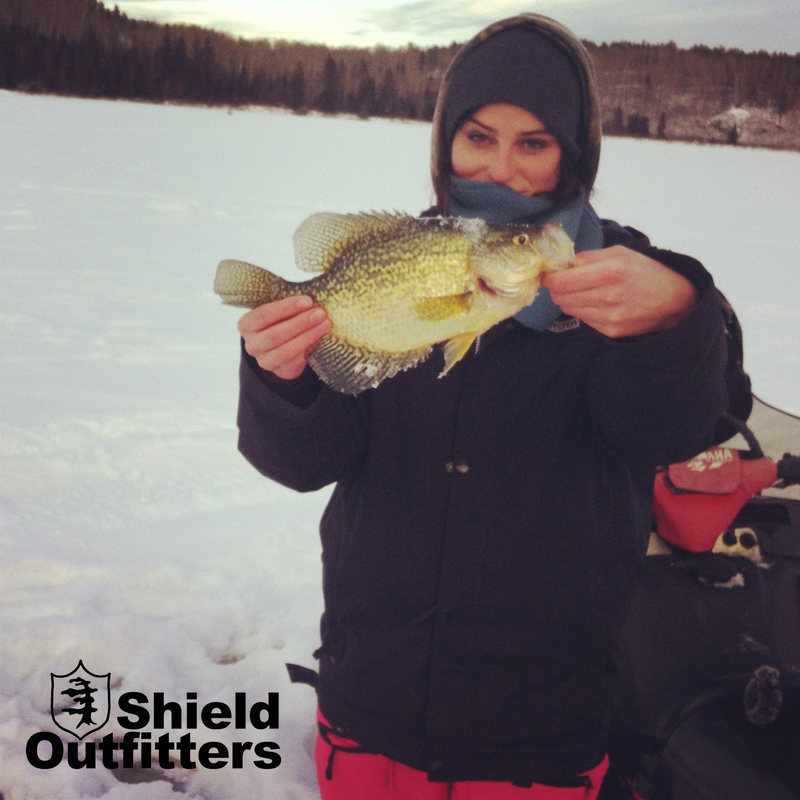 The author and owner/guide of Shield Outfitters with a nice 15.5″ crappie from the Whiteshell. Locating crappie requires a flasher. Usually feeding crappie will be suspended halfway up the water column. I start by drilling several holes and move around from hole to hole with my flasher, moving my bait up and down through the water column to try and find a fish. If crappie are nearby they will often come over and investigate your bait and you will see them on your flasher. I would never stay at a hole that doesn’t have a fish under it for more than about five minutes without moving. Locating fish is half the battle, and getting them to bite is the other half. Crappie can the easiest fish to catch if they are in the mood. Catching one will often trigger the competitor within them and start a feeding frenzy among the school. However more often then not, and especially in the winter, it can be very difficult to trigger that bite. 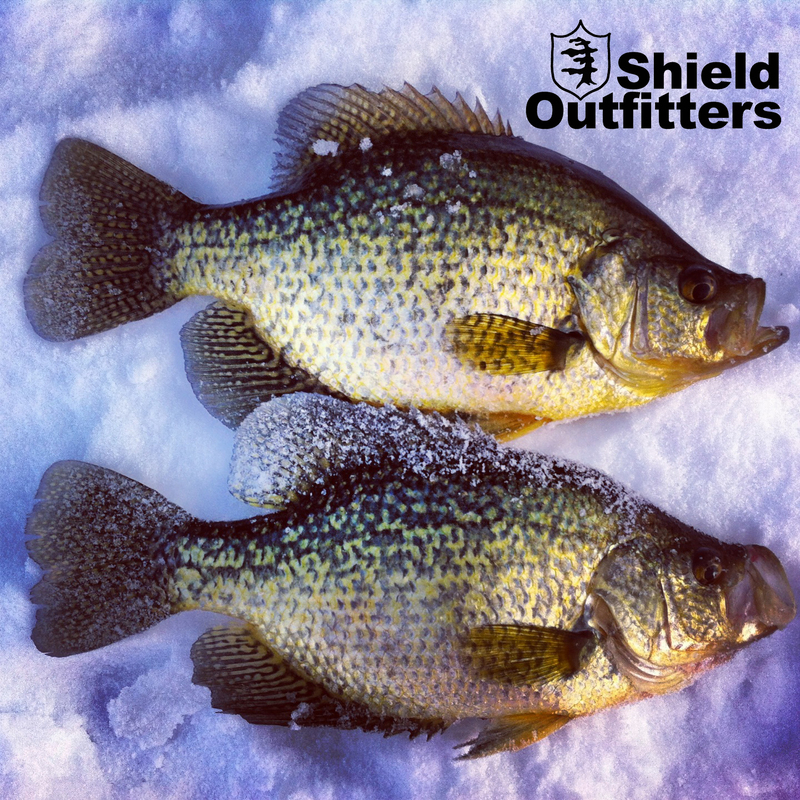 Crappie can be very sluggish in the winter and may hang out and look at your bait for hours without biting. If you’re fishing on a lake that allows live bait, they will usually out-fish artificial bait. However in the Whiteshell our regulations require us to use artificial baits. So I like to use a very light, 1/16th or 1/32nd ounce jig with a minnow shaped bait to match. To fish such light baits you need a light action rod and very light line, my preference is a 2 – 4lb fluorocarbon line. Light lines provide the best fishability with light baits, but you must be careful when setting the hook and bringing fish through the hole as it does break easily. My favorite colour to use by far is Glow. Glow baits have phosphorous in them and store the energy of light they’re exposed to and emit it slowly in the dark. This gives the bait a light green glow and makes it highly visible. Glow baits work well in the Whiteshell because many of the lakes have stained water, and there is very little light under snow-covered ice. (Try supercharging your glow baits to make them extra visible by shining a bright light on them for a few seconds before they go down the hole, I keep my headlamp in my pocket for this reason). While fishing through the ice, always be open to trying something new. Sometimes even being in the right spot with the right bait doesn’t mean catching fish, especially in the winter. Cold water and short light cycles cause fish to be very finicky and not eating much, and as a result can be difficult to coax to bite. Trying new baits and techniques will never hurt… especially if you can see fish on the flasher. In the winter presentation plays a big role in triggering the bite. I find when the bite is real slow and I can see fish on my flasher that refuse to bite, an ultra slow presentation sometimes works. I find when I hold the rod in my hand I cannot keep it still enough for this technique. The only way is to place the rod on the ice or in a rod holder (I prefer on the ice) and watch the rod tip closely for any movement. I watch my flasher to show me where the fish is and I’ll place my hook just in front of the fish and leave it dead still. When I see the rod tip vibrate or dip down, I’ll grab the rod and set the hook in one motion. If it sits still for thirty seconds or so without a strike I will jig a few times to remind the fish that my bait is down there and try to trigger strike, and then let it sit still for a while again. If that doesn’t work after five minutes, I will change my lure or move to another hole and find a fish that is more receptive. Crappie are fun to catch and delicious, but it is important to practice good conservation strategies. Always use barbless hooks and release anything you’re not going to eat. Sometimes when you get into a school of fish it can be easy to think that there are tons of fish in the lake. Remember that you have found a concentrated school of fish, and removing too many fish from that school will seriously damage the population. Also it’s important to know that the biggest fish in the school are the most successful spawners. If you do get into a group of fish and plan on taking some home, set yourself some limits. Choose to keep only fish between 10 and 12 inches. That way you can bring home a good feed while still protecting the fishery. Crappie fishing can provide constant action. If you don’t have the equipment or knowledge to do it yourself, consider hiring a guide. It’s a great way to get the kids into fishing and the outdoors. This entry was tagged Bait, Black Crappie, experience the whiteshell, fishing, Glow, Ice Fishing, Rod, Shield Outfitters, whiteshell provincial park, Winter. Bookmark the permalink. Hey. Thanks for the info!.. I plan on going ice fishing this winter do u have any spots I can try? I don’t have a flashers so I’m outta luck there. Does white lake have crappie? Glad the info was helpful! I am not sure about White Lake, but there’s lots of great crappie fishing spots in the South Whiteshell! 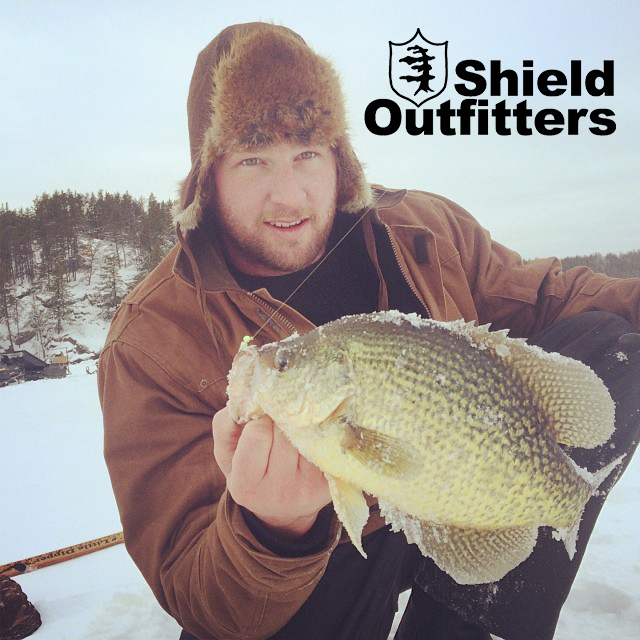 I recommend you contact Ian Young at Shield Outfitters (http://www.shieldoutfitters.com), they are the local crappie experts. Send him an email at ian.flmarina@gmail.com.